This innovative hull engineered specifically for dependable Yamaha Outboards features a sharp entry, 20 degree deadrise, traditional strakes, reverse chines and fully enclosed engines. While the detail and construction throughout is PURE PURSUIT, her styling is more modern. The sleek transom design, sheerline, windshield framework, hardtop and hullside window detail define a vessel unlike any other on the market today. At the bow, the standard horizontal windlass system finishes at the stem with a neat anchor recess notch for the stainless steel plow style anchor. Optional bow sun lounges feature an adjustable backrest, handrails and drink holders. When the cushions are not installed the bow deck recess becomes a styling feature. A heavy duty bow rail and stanchions accentuate the sheerline and installation at just the right height gives added security while walking forward. The single piece, laminated, bonded windshield system is fully integrated with the fiberglass hardtop and comes complete with a large sunroof to bring the outdoors in on those magical days. The sweeping windshield frame holds a one-piece, curved piece of tempered glass forward providing a clear view for pleasurable navigation. The oversized helm chair is complimented to the port side by a comfortable seating arrangement for passengers to share in the overall feel of the boat from the helm. The aft cockpit is highlighted by an extra large lounge, cushioned throughout for additional fun and entertaining. A fiberglass entertainment center conceals a sink with freshwater, electric grill and storage below. Within reach the stainless steel refrigerator keeps your refreshments cold and ready to serve. Natural light filtering through six hull side windows port and starboard and three deck windows overhead, adds to the openness of the cabin layout. A galley, head, convertible dinette and full beam midcabin are expertly engineered and appointed. 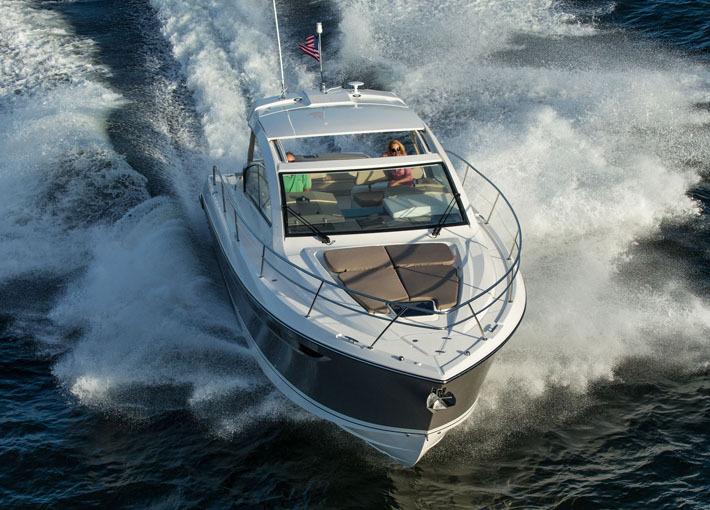 The forward convertible dinette becomes an island berth when you pull each seat inboard. Add the single or twin bed arrangement in the midcabin and 4 adults can overnight in complete comfort. The Pursuit SC 365 will change the way you dayboat or overnight and delivers the most exciting sport yacht design and innovation in the market today. An experience best enjoyed first hand, visit your factory authorized Pursuit dealer for a truly remarkable new product. 12v Cockpit Refrigerator 2.3 cu. ft.